In which G.M. 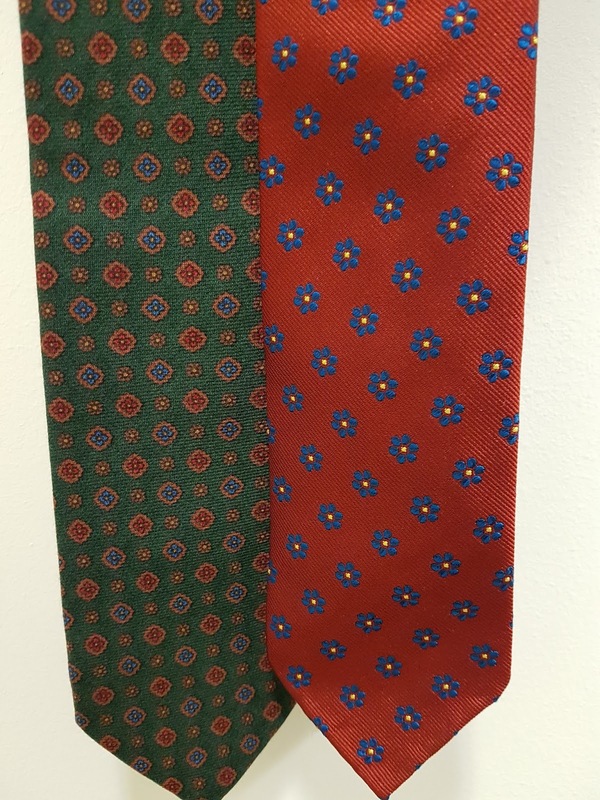 Norton shows you two new ties from an exciting men's accessories company. I’ve always been a lucky so and so. As a child, I regularly won the colouring competitions in the local newspaper on what seemed like a weekly basis – prizes included Thomas the Tank Engine bedding and wallpaper, a lego set and tickets to see Babes in the Wood at The Palace Theatre in Manchester. 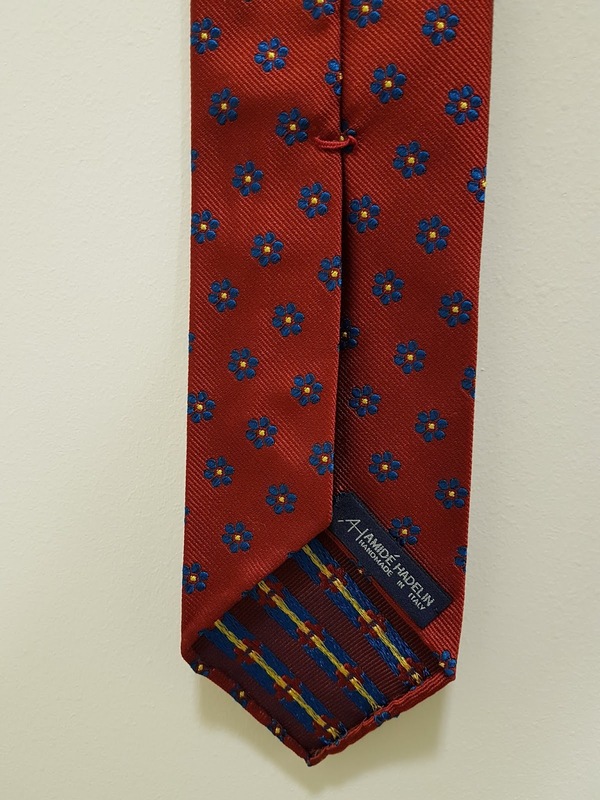 A couple of weeks ago, I was lucky enough to win a new neck tie from Amidé Hadelin, a rather natty menswear accessory company in Holland. 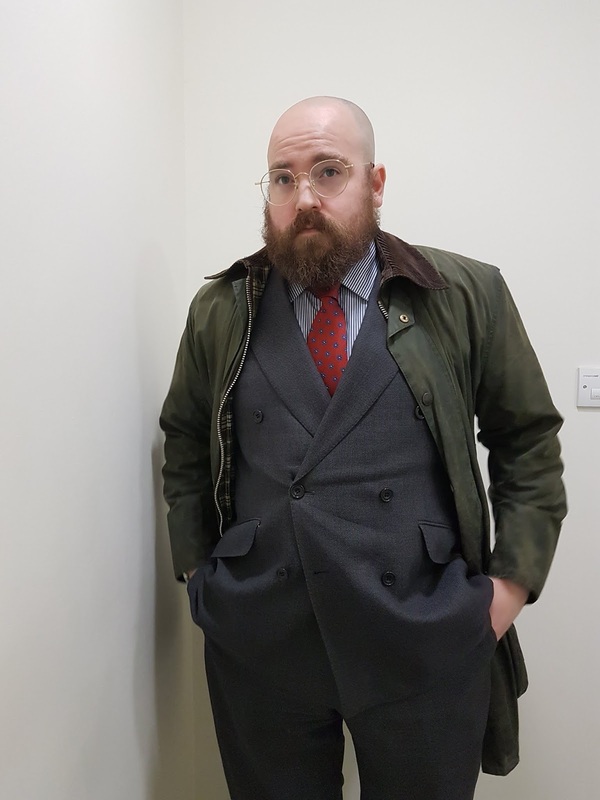 At this point, I should warn you about visiting the Amidé Hadelin website, as you will find yourself lusting after their selection of braces, pocket squares, socks, gloves, brollies and sunglasses. And of course, ties. 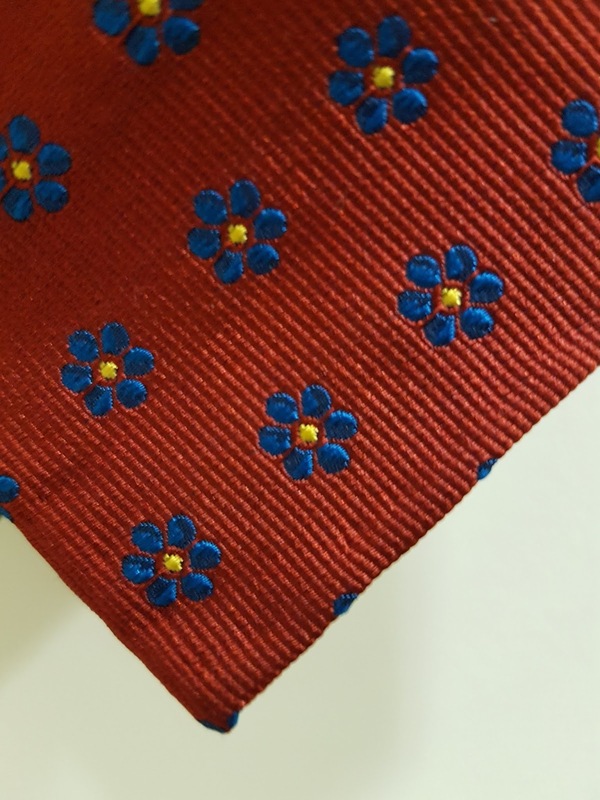 My prize from the Instagram contest was a red Jacquard silk floral tie. 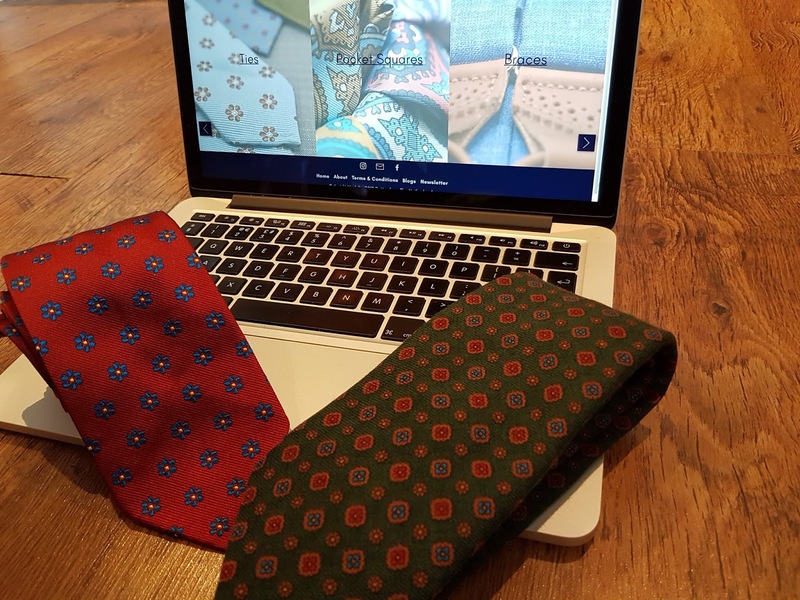 When sorting out where to send my new tie, Amidé Hadelin noticed my electronic periodical and asked if they could send me a second tie, in exchange for a write-up about them. Well, naturally I accepted. So here goes. Their untipped grenadines are absolutely glorious, but what I was really drawn to are their selection of prints. They really have that ‘oomph’ that lots of contemporary printed ties just don’t have. Looking through their tie selection, they really have that 1930s to 1950s aesthetic, which I adore. Classic men’s style at its best. Both ties arrived from Holland in double quick time and I had the package open quicker than you can say Jack Robinson. Upon removing them from their protective wrapping, it was just a wonderful, wonderful experience handling them for the first time. While one is silk, the other is wool, so different textures to enjoy. 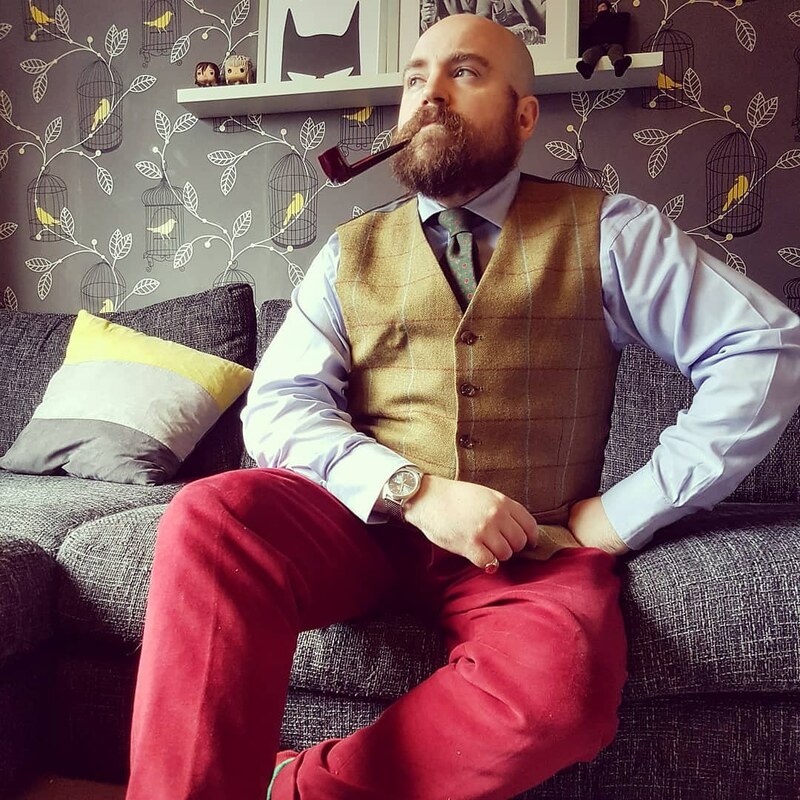 My competition prize red Jacquard silk tie was as lovely as the photographs suggested. Red ties probably make up a good 50% of my tie collection. But that’s fine by me, I just can’t resist them. The yellow and blue of the flowers are quite vibrant against the more muted backdrop of the rich red. Bearing the lapel ‘Handmade in Italy’, the fabric is also from the Italian region of Como, famous for being the summer home of George Clooney and of course, it’s silk. This is the slightly narrower of my two new ties at 8cm. A three-fold untipped construction, it is a joy to wrap around my neck. The benefit of a red tie is just how versatile it is. Whether worn with a grey suit or a tweed jacket, it performs it’s job with aplomb. My second tie was something of a surprise. I’d selected five different options so I didn’t have the foggiest which one Amidé Hadelin was going to send me. 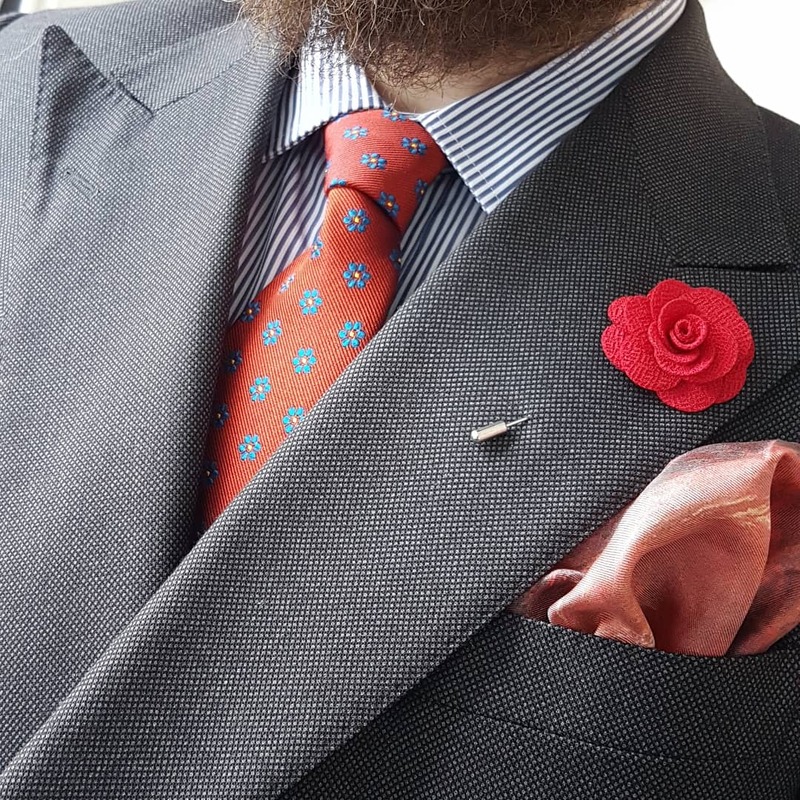 While the red Jacquard silk tie was sourced and constructed in Italy, the Bigi Milano wool tie has both English and Italian heritage with the wool handprinted in Macclesfield. As you may have guessed, Bigi Milano operates in Milan. Now in their third generation of making ties, they clearly make some exquisite neck ties. 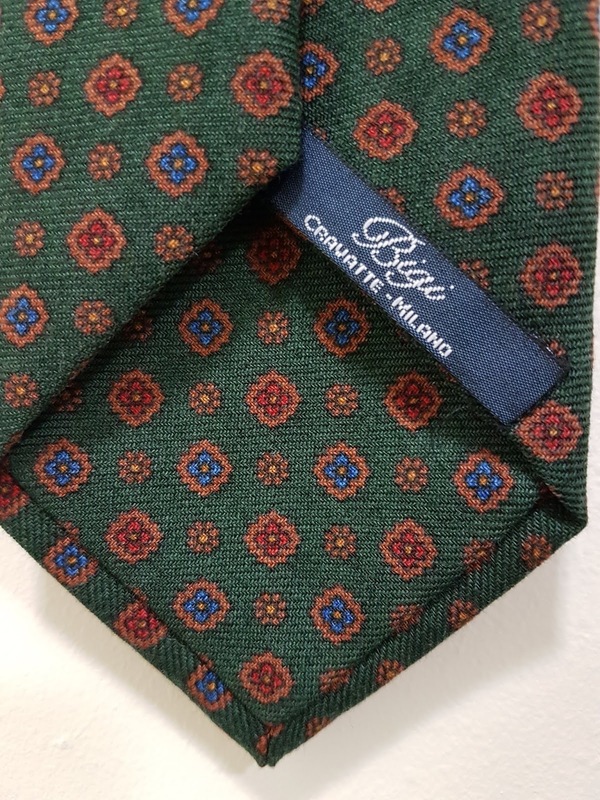 A lovely muted green with a very British floral design, the Bigi Milano tie is pleasingly weighty. A touch wider than the red tie at 8.5cm, it is the same length at 150cm. 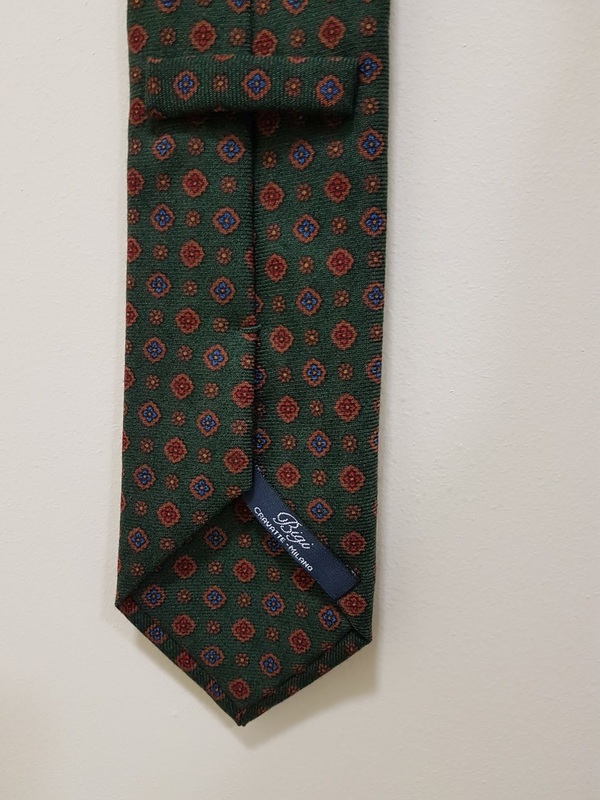 A three-fold construction, this one is self-tipped which means that the tie is finished on the backside with the same fabric as the tie itself. 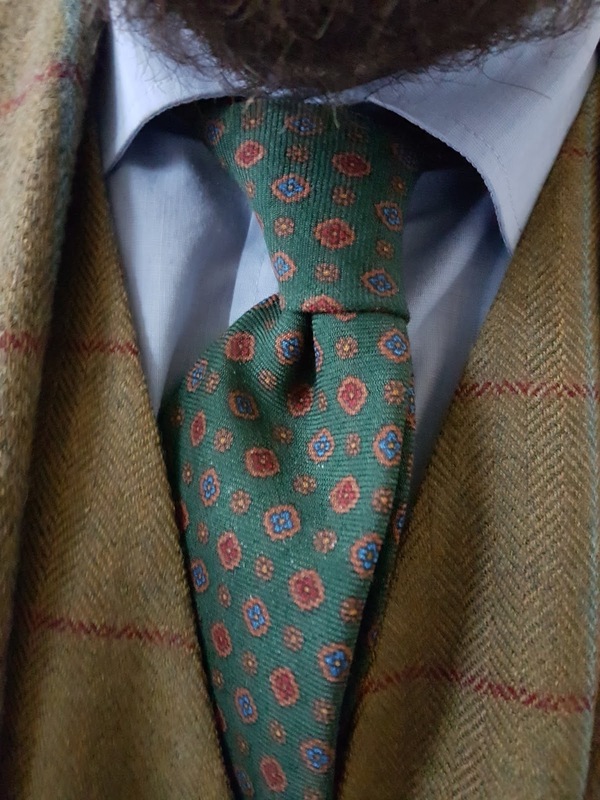 The green tie will work well with other earth tones – perfect for a fellow with an infinite need for tweed. Both these ties are handsewn with the finest materials from England and Italy. The fabrics must be seen to be believed. 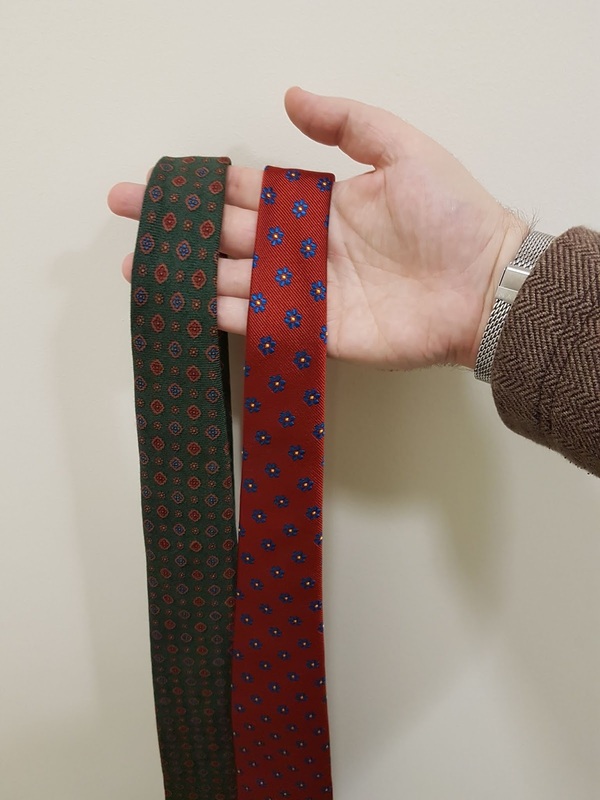 Comparing them next to other cheaper ties, the difference is clear. Do take a look at Amidé Hadelin and if you’re on Instagram, they have been running weekly giveaways so try entering – you never know your luck!